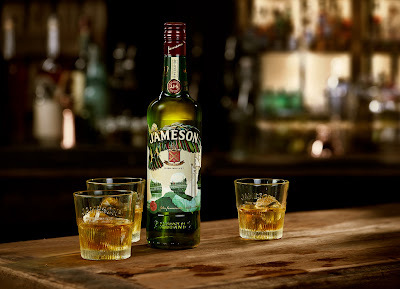 Jameson Irish Whiskey, has unveiled its seventh limited edition bottle, ahead of its annual St Patrick’s Day festivities. For the first time in its history, the Irish Distillers owned brand has collaborated with a group of artists, representing the bravery, unity and opportunities that are possible when friends come together. Irish illustrator Claudine O’Sullivan led the design process, recruiting two close friends from different creative fields to form a collective to curate the label. British designer, Alex Mellon, and Irish photographer Leonn Ward joined O’Sullivan, with the result being a design that celebrates the openness and spirit of friendship that Ireland is renowned for. The 2018 collectable bottle is inspired by the Fianna; Irish mythological warriors known for valuing loyalty and bravery – the foundation of every strong friendship. Claudine’s soaring eagle, drawn by hand, represents the unity felt by the silhouette of three friends on a night out – shot against Dublin’s Ha'penny Bridge by Leonn. The three friends on the label are depicted rallying around banners and symbols representing Irish tribes of past and present, drawn by Alex, and are set to inspire whiskey drinkers around the world to come together and celebrate St. Patrick’s Day with Jameson. New for 2018, each limited-edition bottle will be equipped with a near field communication (NFC) chip which allows consumers to access content on jamesonwhiskey.com where they can find out more about the artists and the story behind their design. Jameson's 2018 St Patrick's Day limited edition bottle, will be available later this month from specialist retailers, for a RRP of €30.00.